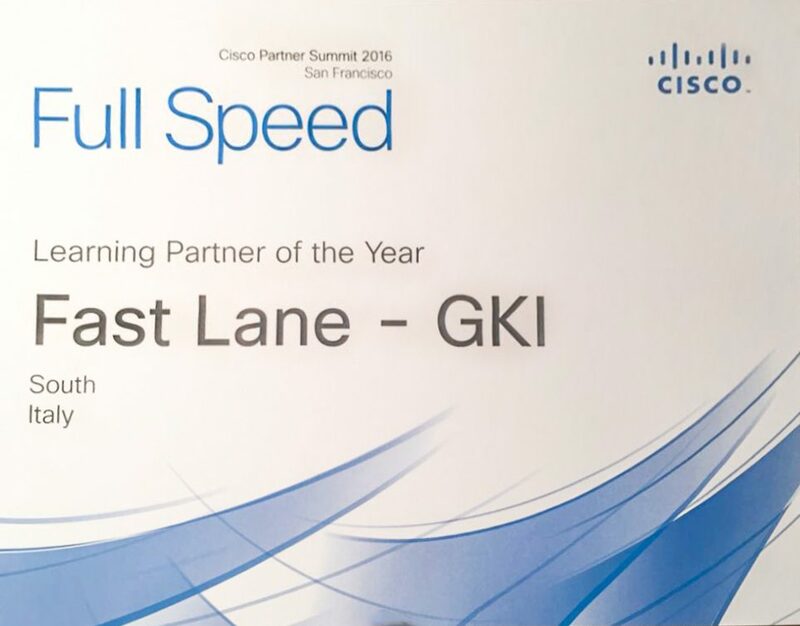 Milan, November 17th 2016 - Fast Lane - GKI announced today that it has received the Cisco Learning Partner of the Year 2016 - South EMEAR and the Cisco Learning Partner of the Year 2016 - Italy awards at the Cisco Partner Summit, held in November 2016 in San Francisco (USA). Awarded to exemplary channel partners, the Cisco Partner Summit awards are designed to recognize best-in-class business practices and serve as a model to the industry. Areas of consideration include innovative practices, architecture-led approach successes, strategic business outcome-focused programs, seizing new opportunities and sales approaches. Fast Lane - GKI was awarded with the Cisco Learning Partner of the Year 2016 Italy and South EMEAR, and therefore recognized as a partner of excellence in the implementation of IT solutions and of ICT professionals training on Cisco architectures: Enterprise Networks, Collaboration, Cloud, Security and Internet of Things. "We are extremely pleased to have been able to achieve our goals and Cisco, with this award, has recognized our quality level in the education market. This award reflects the hard work and dedication of our entire team. From here, we can continue to pursue our successful business model, based on the strong orientation towards customer satisfaction", said Francesco Dell'Apa, CEO, Fast Lane - GKI.